Written on 05 July 2015 . On the day of competition Wednesday (June 22), young Vovinam Championships XIII 2015 times nationwide Vinatex Cup competition took place at the stadium Le Trung Kien (Tuy Hoa – Phu Yen), the Can Tho boxer to win 4 units to chasing gold medals leading position of Ho Chi Minh City. Boxer Tran Tho won 4 gold medals in the middle of his cabinet attended. The duo Cao Thi Huyen Trang Le Thi Anh Tien and bring back the gold medal Dual Training 1 female aged 12-15, Do Quang Bui Hung Cuong and also won Gold Medal School Dual Training 2 men ages 12-15. Meanwhile, Mai Thanh Nghi and Lam Thi Thuy My overcame a very strong pair of Ho Chi Minh City Nguyen Thi Tuyet Mai and Nguyen Thu Thao to win gold medals content Song 2 female training. Tran Van Ho and Nguyen Tuan Khanh Tho help with the 10th Gold Medal at the right content to have the highest score in exam preparation Song 3 men ages 16-18. The gold medal rest content rights belong to Ho Chi Minh City as the duo Le Minh Sang and Do Dinh Hung excellent play won gold in the men’s sword training content Song ages 12-15. The gold medal rest content rights belong to Ho Chi Minh City after the pair Do Dinh Le Minh Hung Sang and played outstanding gold medal in content Dual Training for ages 12-15 men. Meanwhile, the weight class antagonism is pretty drastic. Ho Chi Minh City represents only a single contribution in the final. That is the defending champion 51 kg weight class Tran Tan Thuan south. Meet Le Nguyen Duy Tan in gold medal matches, boxer Ho Chi Minh City before playing wise competitor might look superior to then win the final 2-0, successfully defended the championship ages 16-18. The Quang Ngai boxer won the right to compete in two finals and the men’s 57 kg weight class 42 kg female. They showed strength with spectacular victories. At 57 kg male, Nguyen Van Tien had a successful retrograde though he were rivals Nguyen Sy Son of Dong Nai 6 point lead. Determined to win and do our best, he has balanced the score in the second round last Tuesday and then win 3-0 in overtime to win the gold medal. Le Phuong Nghi Huynh also easily beat Nguyen Thi Thin Hanoi to take the Gold medal women 42 kg weight class. 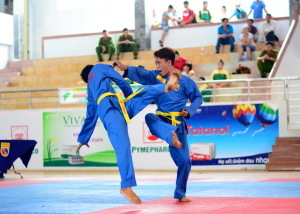 In men’s 45kg weight class, representatives of Thanh Hoa Pham Van Giang has allelopathic completely close range punches of Dang Van Hau devilish (Ba Ria – Vung Tau) to win in the finals. One other boxers of Thanh Hoa Le Thi Lan Anh also won against Hoang Thi Hong of Cao Bang to bring about weight 54kg Gold Medal female. Doan Vinh Long with the first gold medal in the men’s 42 kg weight class at Chi Hai Tran Tho when boxer to retire injured before the finals. Pacific also first gold medals at this year while Le Thi Thuy Nga Tran Thi Anh Tuyet pass by the home of Phu Yen in the final women’s 45 kg weight class. Ho Chi Minh City was briefly led with 12 gold medals, 4 silver medals, 1; Tho runner when 10 gold medals, 4 silver medals and 3 bronze medals; Thanh Hoa is ranked third with 6 gold medals, 2 silver medals and 2 bronze medals.